All Inclusive Contracting is proud to use UNIFLEX roof coating solutions via our local Sherwin Williams partnership. Below are some of the many benefits of having a UNIFLEX fluid roofing system. No Disruption To Occupants. With UNIFLEX, there is no need to close the building during installation. The non-toxic formulation means no disruption to occupants and no interruption of business. Lightweight Solution. Unlike traditional roof replacement, UNIFLEX Fluid Applied Roofing Systems provide a lightweight solution to roofing needs. It’s ounces, not pounds, per square foot. Longer Building Life Cycle. 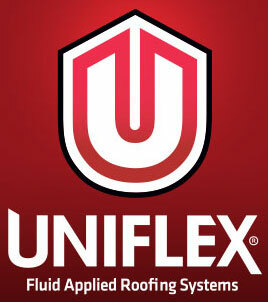 UNIFLEX Fluid Applied Roofing Systems are installed onto existing roofs to extend the service life of the facility. Great Weather Durability. UNIFLEX Fluid Applied Roofing Systems are resistant to blistering, chalking, checking, cracking, and flaking — protecting the roof from further weathering and degradation. the environmental benefits are significant. Lower Roof Temperatures. Highly reflective white coatings reflect 85% of the sun’s radiant heat, dramatically lowering the temperature of the underlying roof and preventing further degradation. Proven Performance. UNIFLEX Fluid Applied Roofing Systems are fully adhered and monolithic (seamless), protecting the investment and providing maximum durability. Significant Energy Cost Savings. According to EnergyStar.gov, having a white, reflective roof reduces the roof’s surface temperature by up to 100°F, significantly decreasing the amount of heat transferred into the building and reducing peak cooling demands. Higher reflectivity = lower energy consumption and lower cooling costs. Cost-Saving Installation. UNIFLEX Fluid Applied Roofing Systems are typically easier to install and maintain than a conventional tear-off roof and also eliminate unnecessary construction waste. This means such projects generally cost a fraction of the price of a new roof installation. Tax Benefits. Because roof maintenance system jobs are often deductible in the rst year while most total roof replacements are not, some building owners realize a tax benefit when using UNIFLEX Fluid Applied Roofing Systems. Utility Rebates. Some utility companies offer rebates to building owners who conserve energy by using white reflective roof coatings. Local utility companies can provide more details about their energy rebate programs. Further details can be found at www.dsireusa.org. Call us today at 602.550.0499 to learn more about UNIFLEX roofing systems and for a free project consultation.